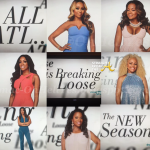 The Real Housewives of Atlanta aired the 7th episode of it’s tragically messy eighth season last night (December 20, 2015). 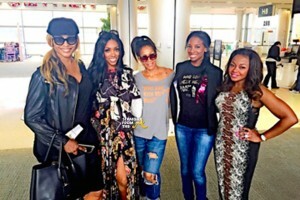 Last week, we were left with a cliffhanger which involved a physical altercation during the ladies’ Miami girl’s trip. This week’s episode is titled, ‘Miami Spice’ as the drama continues with Kenya ‘Messy’ Moore leading the charge. The ladies continue living La Vida Loca in Miami, but trouble arrives in paradise when a guest of the house takes the drama to new heights, causing tensions to rise. Porsha takes time away from the ladies for a steamy date with a hot new suitor. After the dust settles, two of the women decide to trek back to Atlanta, leaving a small crew behind to enjoy the Florida sun. Kim’s apprehension about Kenya is pushed to the limits, forcing her to reconsider her decision about continuing this newfound friendship. Things get a bit out of hand when the ladies bring a few ‘party favors’ back to the house for a night cap. 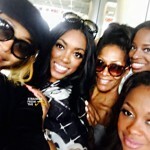 Porsha’s new latin love and Tammy’s two ‘nephews’ all dive in to the private pool for a bit of fun and things get tense when Glen Rice, Jr. curves Kenya’s advances. Rice also seems to rub Kandi the wrong way and that’s all the evidence Kenya needs to play security and launch her attack. Tammy’s nephew seems to be getting close to Sheree and Kenya isn’t feeling it so she decides he needs to leave because he’s ‘acting weird’. 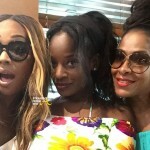 The ladies tell Tammy that its time for her nephew to go but she’s a bit too inebriated to handle the situation as quickly as Kenya would like. Needless to say, Kenya turns up and turns out and Glen Rice wasn’t having it! Kenya’s finger popping and dress flinging clearly didn’t impress the former ball player and being that Rice was already over Kenya’s over the top attention grabbing antics, Moore’s choice to speak to him AT ALL was the spark that lit the flame. As Kenya try to put Glen Rice out, Tammy steps in to calm him and he gets pushed out of the way as security intervenes. Tammy falls and hits her head and suffers a concussion during the melee. Here’s the thing, clearly Rice is a brash character, but most of the women agree that none of this would have happened without Kenya’s intervention. She shoulda left that man alone cause he was NOT seeing it for her. It’s only been a few weeks since Porsha declared herself a ‘sugar mama’ and threw that awkward party for her new boy toy, Duke Williams, but since Duke’s been pulling away Porsha has decided to play the field. Porsha decides to explore her ‘wild side’ in Miami and gives all of their male visitors a free peep show as she twerks by the pool. Her ‘playdate’ Oliver, is pleasantly amused and even jokes that he’s sleeping over. While Porsha and Oliver eventually got up close & personal in the Jacuzzi, the night comes to an abrupt end when Kenya decides to wage war against Tammy’s nephew for rejecting her advances. That gives Porsha a chance to turn what would have been a one night stand into a real date. Porsha and Oliver go out to dinner and even though he dives in for a kiss a bit ‘too early,’ things seem to go well and Porsha is anxiously anticipating a 2nd date. Phaedra and Sheree share a moment where they bond over the fact that they both have sons being raised in today’s racially charged times. Parks points out how it doesn’t help matters that Kenya declared war on what appeared to be another innocent Black man who has been wrongly accused. 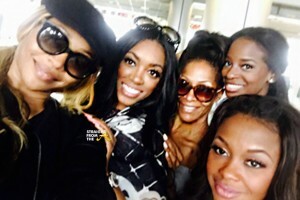 Rice may have been rude to Kenya and Kandi but he was clearly getting along with the other ladies. There was no reason for Kenya to get involved, except for the fact that she was in her feelings about being shaded. Phaedra gets emotional when she starts to think about young men of color who have lost their lives over trivial matters such as this, which seems to be a lead up to the ladies appearance during the Million Man March 20th anniversary event last October. 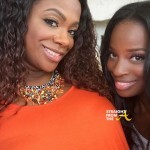 Kim and Kenya have been bumping heads for the past few episodes and it’s not getting any better. When the two meet for lunch after the Miami incident, Kenya tries to imply that Kim is having problems at home. Kim squashes that REAL QUICK and forces Kenya to elaborate on her implications. 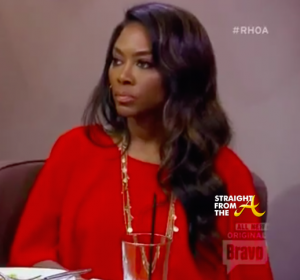 During the conversation, Kim makes it clear that she feels that Kenya is a sh*t starter and basically tells Kenya ‘I see you, boo!’ and Kenya’s red eyes say it all, she knows she’s been figured out! It didn’t have to happen that way… it seems like you were manufacturing some drama. Let me be clear sweetie. When you provoke somebody and you accuse them of things, that’s something I’m not going to take part in. Kenya tried to justify her actions… calling Glen ‘aggressive’ stating his ‘physicality’ was threatening… hell if Kenya had a gun, she would have probably shot first and asked questions later. The ‘irrational’ one in the situation was clearly Kenya but again… she’s doing what she’s paid to do. That doesn’t mean Kim Fields has to accept it though. 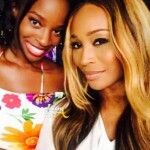 Kim working with Kenya on that pilot is probably a wrap too. These two certainly don’t see eye to eye on much of anything and while Kenya is still trying to ‘play nice’ she’s also throwing jabs on the sly. Just last week she insinuated that same thing about Kim’s marriage in an interview…. I don’t see a friendship forming there. AT ALL! 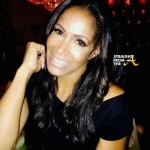 What did you think of this week’s episode of ‘The Real Housewives of Atlanta’?